Pinot and Prose: I Love My New Toy! Goodbye craptastic photos of previous years! 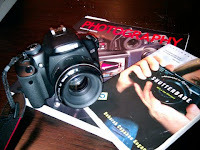 2010 has already brought many new joys, most specifically my new toy, a Canon Rebel camera! And on the same day I bought the camera, I received a package from Lisa who was the one recommended the Rebel. In it, she sent two books: Shutterbabe and Photography. She even marked the pages that would be particularly helpful to me: food photography, light, depth. It was a double blessing: a camera and a wonderful, thoughtful friend! Eat, drink, capture every moment! Happy New Year! The one of Iz is NYT worthy! I can't wait to know what you think of Shutterbabe!